Marcel Kittel has abandoned the Giro d'Italia because of illness following his two weekend stage wins in Ireland. The German did not start Tuesday's 112-kilometre fourth stage from Giovinazzo to Bari - the first in Italy - because of what his Giant-Shimano team described as a "fever". "I am very disappointed about leaving the Giro after such a strong start," said the 26-year-old. "But I do not feel healthy and I am not in the position to start." 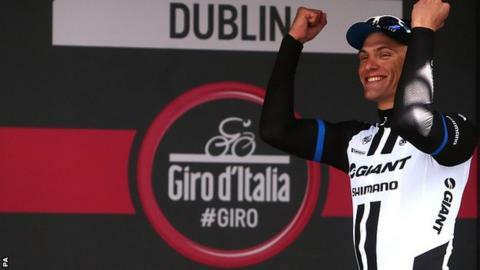 Kittel took victory after a bunch sprint in Saturday's second stage in Belfast, then produced a late burst to pip Sky rider Ben Swift in Sunday's stage in Dublin. Giant-Shimano team coach Marc Reef said on Tuesday that Kittel had complained of feeling unwell after Sunday's stage. "Yesterday morning he said that he felt better, but this morning at breakfast he had the same complaints," said the Giant-Shimano team boss. "After a few check-ups with our team physician we saw that the fever had deteriorated and so we made the decision together that he should not continue." Meanwhile, Dan Martin hopes to be back in training soon despite being forced out of the Giro by a broken collarbone. The Irishman, 27, sustained the injury in Friday's opening team trial in Belfast and he and injured Garmin Sharp team-mate Koldo Fernandez both underwent surgery in Dublin on Sunday. On Tuesday, the Irishman indicated his discontent that his surgery had not been performed in Belfast. The Irish rider criticised both the hospital authorities in Belfast and Giro d'Italia organisers RCS. "Feel very lucky to have such great family/friends who visited and organised surgery for me and Koldo in Dublin. NHS/RCS left us high and dry," Martin tweeted. "Thanks for the amazing support since crash. Surgery went well." It is not yet clear whether Martin will be fit to compete in the Tour de France which starts in Leeds on 5 July. Next stop Tour de France? Read more on After successful Giro, is next stop Tour de France?